The list of achievements for Army of Two: Devil's Cartel recently dropped and I'll admit, I'm a little disappointed. There's not a single achievement for fist bumping your partner. Not one! What is the world coming to??? Anyways, there are still a few co-op specific achievements that have been revealed amidst the usual overall progression ones. No spoilers in the list, so feel free to peruse away. While there may not be a great number of co-op achievements for the game (at least when you consider how they've focused on making it cooperative), Nick's limited hands-on time with the game makes it sound like it should be a fairly solid co-op title. Personally, I'm a fan of the "Double Trouble" and "Combo Master" achievements, and appreciate the image used for "TWO heads". 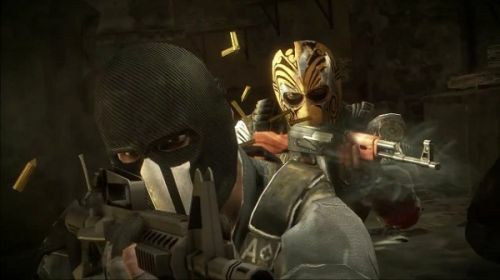 Army of Two: Devil's Cartel arrives later this month on March 26, so get ready to don your mask and make a silencer from a soda can. Page created in 0.2865 seconds.